Steven Spielberg's Boom Blox has failed to fulfill sales expectations. Judging by the low sales of Boom Blox, even Hollywood directors can't outsell Nintendo's first party Wii titles. 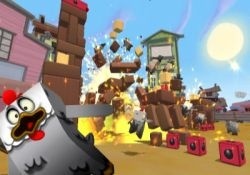 With only 60,000 units sold, Boom Blox barely made the top 25 selling games of May and placed ninth for the Wii. In attach rate terms, only .6 percent of North American Wii owners own a copy of Spielberg's full-priced puzzler. NPD analyst Anita Frazier gabbed with GameDaily about Boom Blox being released alongside iconic Wii games like Super Smash Bros. Brawl and the adverse affect on sales competition would have. "It's still really hard for new IP to breakthrough the noise in the market," she explained, "and there has been a lot of noise so far this year... there have been some really high profile game releases. The game was really well reviewed so I'm suspecting the marketing just didn't break through the clutter to the extent that they were hoping for."